The most favorite for this property is One North MRT station. Just need few minutes to reach property by walk. We can go to National University Hospital easily, just 1 station from One North. The Staff is extra nice. I thought Pusba and Darren and Revathi made my stay very memorable. The MRT is downstairs. Starbucks and other restaurants are there too. Ya Kun Kaya Toast is here too! Lots of Americans seem to work here. It's 15 minutes away from downtown. It's no big deal not being in downtown since the MRT is so convenient, rapid and inexpensive. Loft style with washing machine. One Queen Bed only so good for single and couples only. Very much enjoyed my stay!! I booked this place not realising it is a serviced apartment, I thought it was a hotel. However, that disappointment turned out to be an advantage. The place is clean, well maintained, staff fantastic and food court right at the basement. The food court has unique restaurants where you choose all the ingredients you want to eat and they weight it, you pay and they cook it for you right there and then. You can take back to your apartment or sit down there, relax and eat. Fantastic area indeed. I definitely would come back. The design is very cosy and welcoming. Area is spacious and friendly for gathering. The room was excellent. It was spacious and comfortable. This is probably the best non 5 star hotel accommodation in Singapore! It is a home away from home. This is my second stay at this property. The staff are excellent and the accommodation is great. It’s like having a 5 star hotel in an apartment . Facilities are exceptional. There’s nothing you need that isn’t there. The best thing yet is the food court at the basement. Just go there and you choose whatever you want to eat and see it cooked right there in front of you and you take it back to your apartment. The supermarket is also at the basement as well as a metro train station. I would love to visit again in the future. Lock in a great price for Citadines Fusionopolis Singapore – rated 8.6 by recent guests! Citadines Fusionopolis Singapore This rating is a reflection of how the property compares to the industry standard when it comes to price, facilities and services available. It's based on a self-evaluation by the property. Use this rating to help choose your stay! One of our best sellers in Singapore! 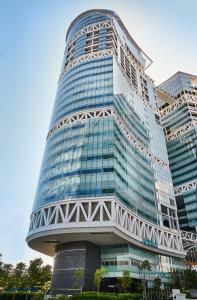 Citadines Fusionopolis Singapore is conveniently located at the doorstep of one-north MRT Station on the Circle Line. It features stylish lofts with a fully equipped kitchen and free high speed internet access. Citadines Fusionopolis is located a 3-minute drive from Rochester Park, while Holland Village is a 6-minute drive away. The residence is a 30-minute drive from Singapore Changi Airport and the Central Business District. A supermarket, food court, bistros and restaurants are available in the adjoining complex. Modern lofts come with a living room, dining area and well-equipped kitchen with a coffee machine and stove. Modern conveniences include an iPod dock and a washing machine. A game console is available upon request. Located from the 17th floor, each loft has a balcony overlooking the city. The residence also provides concierge services, laundry and dry cleaning services. Housekeeping services are available three times a week. When would you like to stay at Citadines Fusionopolis Singapore? This contemporary loft-style apartment features a queen-sized bed and stunning views of the surrounding areas. The apartment is furnished with a modern kitchen and includes a complete home entertainment system in the living room. This contemporary loft-style apartment features a queen-size bed, a fully-equipped kitchen and separate living and dining areas. It includes a complete home entertainment system, a safety deposit box and ironing facilities. A game console is available upon request. Fitted with floor-to-ceiling windows, this modern loft-style apartment features a queen-sized bed, a safety deposit box and a flat-screen cable TV. It is equipped a mini fridge, microwave oven and electric kettle. 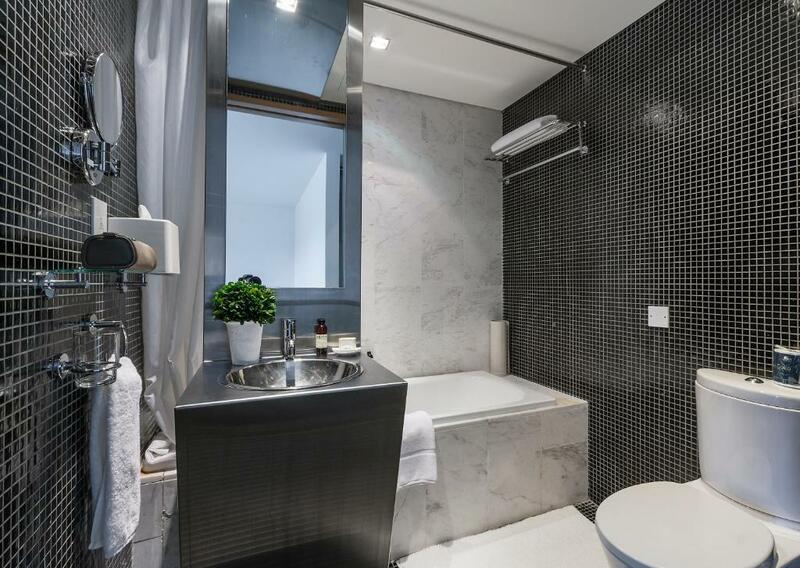 Located on the second floor, the bathroom includes shower facilities. This modern loft-style apartment features a queen-sized bed, a fully-equipped kitchen and separate living and dining areas. It includes a safety deposit box and a complete home entertainment system. A game console is available upon request. Citadines Fusionopolis Singapore is part of a 30-hectare mixed-use development that is strategically located in one-north business park, Singapore’s research & development hub which houses more than 400 companies. The development is well served by food & beverage outlets and retail amenities, including a supermarket, medical centre and post office amongst other stores. Commuting from the serviced residence is a breeze with the one-north Mass Rapid Transit Station located within the building, and you are only a 30-minute ride from the Central Business District. Situated at the doorstep of one-north MRT Station on the Circle line, we are located at Singapore's most exciting infocomm, media, science and engineering R&D hotspot. Our work-loft residences are an integral part of the live-work-play setting. We are sited within Fusionopolis - a mixed-use complex that is also home to F&B outlets, fitness clubs, experimental theatre and media studios, and F&B outlets. Nearby is the National University of Singapore. 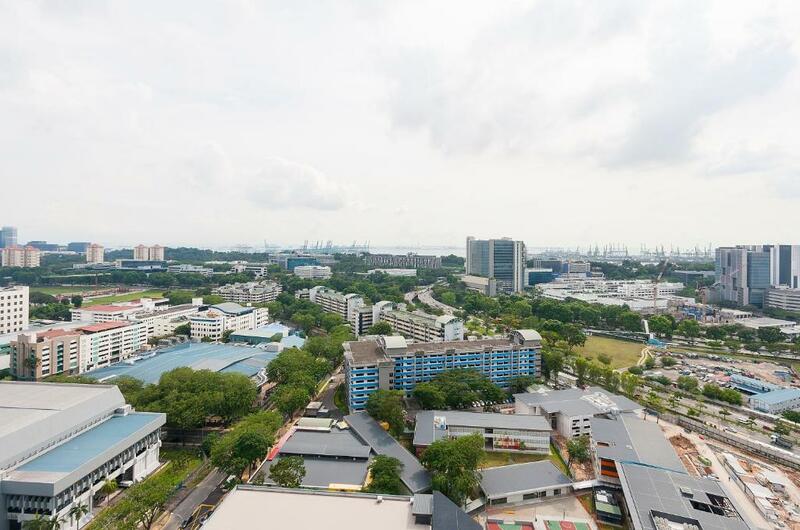 You are only a 30-minute ride from the Central Business District and can easily access attractions such as Science Centre, Haw Par Villa theme park, as well as a popular dining spot, Holland Village. It is also close to the National University of Singapore, National University Hospital and Singapore Polytechnic. House Rules Citadines Fusionopolis Singapore takes special requests – add in the next step! Citadines Fusionopolis Singapore accepts these cards and reserves the right to temporarily hold an amount prior to arrival. Please present the same credit card used to guarantee your booking when checking in / making payment at the serviced residence. Please note that serviced residence may contact the cardholder for verification purposes. Please inform Citadines Fusionopolis Singapore of your expected arrival time in advance. You can use the Special Requests box when booking, or contact the property directly using the contact details in your confirmation. There’s nothing negative about this place. Love it and the excellent staff. The room is dusty. The balcony is useless. We got an email half way through our trip saying that you must be at least 21 to stay at the hotel and my partner and I were not so we had to contact our parents to ensure that they acknowledged our stay here this all caused a lot of stress and worry. We had booked this nearly 6 months in advance and were not given any indication of this age requirement, had we been notified of this prior to our stay we could have either sorted it out before ensuring no stress or found somewhere to stay. the cleanliness of the place was ok, but could have been better with more well-cleaned floors and cupboards. Some of the cupboards had a musky smell. There should also be a pick-up service for the trash being that we are in a service apartment. I like the exclusive feel of the apartment and the location. The room was brightly lit by the natural sunlight that filled the room during the day, and kept the room feeling bright and cheery all day long. Bright and the view great. All staffs are very friendly, service is really nice. The apartment was in a business area so it was quiet but I still found everything I needed close by. Even live music in a nearby food centre. The apartment was lovely with all mod cons. The bed was super comfortable and the view of the skyscape was wonderful to wake up to. Staff were friendly and helpful. I really recommend to everyone. Breakfast IS NOT included if you use booking.com which was misleading to me. It's just a few bread rolls, hard boiled eggs and cereal boxes anyway. Coffee/espresso machine is free to all guests. the toiletries were insufficient. Too small bottles of shampoo, shower gel that could only last 1 use. We stayed 3 days. It would been better to provide a reasonable size bottles. During holiday most shops and eateries are closed so had trouble finding food. Service at reception was good. Security was good. Facility was great. nice deco and comfortable bed.. Beautiful view. Free coffee at reception was a nice idea. In some nights, there is noise outside. It is not the apartment's problem, but it does matter for people who want to sleep earlier.